Efforts to save a cinema which was bombed during World War Two have taken a step forward after councillors agreed in principle to buy the site under a compulsory purchase order. Campaigners want to restore Hull's National Picture Theatre in memory of the civilians killed in the Blitz. The cinema took a direct hit during a raid on the nearby docks in March 1941. Hull City Council said it supported the order, but asked for assurances over funding for the project. Craig McHugh, English Heritage's principal advisor on heritage at risk, said: "I think we've taken a big step forward today. "We've got council commitment to move forward with compulsory purchase. "They are concerned about funding, which is reasonable, but I do believe that funding will come through." 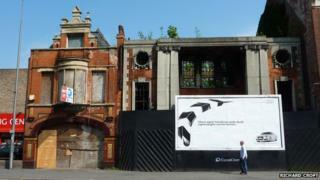 The Grade II listed building, on Beverley Road, has been derelict for more than 70 years. In May the building failed to sell at auction. The National Civilian World War Two Memorial Trust has fought a long-running campaigning to redevelop the site. Trust chair Alan Canvess said: "We are obviously pleased that things are edging forward. "We have monuments for soldiers and some individuals, but there's no national monument for civilians and we see this as the chance to create a memorial for those who died on the Home Front." He said work to restore the former cinema would take place in three stages, with the first - involving restoring the buildings facade - costing about £125,000. More than 150 people were in the cinema on the night it was bombed, but no one was killed or seriously injured.